The European Research Council has awarded HITS astrophysicist Andreas Bauswein an ERC Starting Grant worth approximately 1.5 million euros. Using computer simulations, the aim of the project is to better understand the collisions between neutron stars. These are seen as potential candidates for the formation of heavy elements such as gold, silver and uranium. Interpreting the gravitational waves that were measured during a neutron star collision this summer plays a central role in the undertaking. Astrophysicist Dr. Andreas Bauswein from the Heidelberg Institute for Theoretical Studies (HITS) has successfully acquired a Starting Grant from the European Research Council (ERC). For his research project titled “GreatMoves: General Relativistic Moving-Mesh Simulations of Neutron Star Mergers”, the 37-year-old will receive approximately 1.5 million euros for a period of five years. The HITS astrophysicist will use the funding to set up his own research group. “We are really proud of this success,” says HITS Scientific Director Professor Michael Strube, “because Andreas Bauswein is already the fifth HITS scientist to be awarded an ERC Grant.” The interdisciplinary research institute that was founded by Klaus Tschira in 2010, sees itself as a breeding ground for outstanding young researchers’ careers in the natural sciences, mathematics and computer science. 120 researchers work at HITS on subject areas ranging from molecular biology to astrophysics. How are heavy elements in the universe formed? 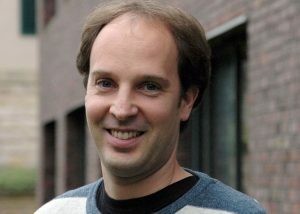 In the project funded by the ERC, Andreas Bauswein will use computer simulations to investigate how neutron stars merge. One of the questions he will consider is how, and how much, matter is ejected during these cosmic collisions and how much light is emitted in the process. This summer, physicists detected gravitational waves and electromagnetic emission from the merger of two neutron stars. The observations suggest that this is where heavy elements like gold, silver and uranium are formed. The origin of these elements has not yet been elucidated conclusively. The new calculations should help to solve this astrophysical puzzle once and for all. Bauswein is also interested in what the gravitational waves that have been measured can tell us about the fundamental properties of matter. The exact form of the signal sent by the gravitational waves may reveal more about the innermost building blocks of matter Andreas Bauswein will work on certain aspects of nuclear and particle physics which cannot be achieved with experiments on Earth. In order to simulate how two neutron stars merge, Bauswein creates new, hydrodynamic simulations using moving mesh based on the AREPO code, which was developed by Volker Springel at HITS. Andreas Bauswein studied physics in Darmstadt and Heidelberg, moving to the Max Planck Institute for Astrophysics in Garching to take his doctorate and spend his first years as a postdoc. In 2013, an EU Marie Curie Fellowship took him to Aristotle University of Thessaloniki, Greece. Since 2015, he has been working at HITS in Heidelberg in Professor Friedrich Röpke’s research group on “Physics of Stellar Objects”. Andreas Bauswein has become the fifth HITS researcher to be awarded an ERC Grant. Previous recipients were astrophysicists Volker Springel (ERC Starting Grant) and Christoph Pfrommer (ERC Consolidator Grant) and mathematicians Tilmann Gneiting (ERC Advanced Grant) and Anna Wienhard (ERC Consolidator Grant). With its ERC Starting Grants, the European Research Council, ERC, funds basic research projects by outstanding young scientists between two and seven years on from completing their doctorates who, with the grant, can build up their own research group.